One of the best known names amongst the Polish conductors Tadeusz Strugała studied at the Wroclaw Music Academy as well as in Weimar and Venice. He was the General & Artistic Director of the Wrocław Philharmonic from 1969 to 1980. Also in those years he headed the National Radio Symphony Orchestra (WOSPR) in Katowice (1975-1976) and Music Director of the Symphony Orchestra in Ankara (1976-1978). Later he became the deputy Artistic Director and permanent conductor at the Warsaw Philharmonic (1979-1990), and at the same time Artistic Director and Chief Conductor of the Cracow Philharmonic (1981-1986). Next he was appointed the Director and Principal Conductor of the Polish Radio Orchestra in Warsaw (1990-1993), and in 1995 he started his cooperation with the Prague Symphony Orchestra FOK as its Permanent Guest conductor. In September 2008 Tadeusz Strugala returns to the Cracow Philharmonic Orchestra and Choir as General and Artistic Director. Tadeusz Strugała's international carrer began in the sixties' and since then he has performed in concert halls throughout Europe, Japan, Australia, USA and Asia with foreign and leading Polish orchestras. the NTO , the City of London Sinfonia and the London Mozart Players. With the latter Strugała has closely cooperated for over two seasons, appearing in British major concert venues such as the Royal Festival, Queen Elisabeth, Fairfield and David's Halls. 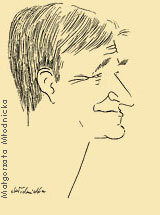 Tadeusz Strugała's repertoire ranges from the classical, romantic and contemporary music, including Polish composers such as Henryk Mikołaj Górecki, Wojciech Kilar, Witold Lutosławski, Roman Palester, Andrzej Panufnik, Krzysztof Penderecki, and Aleksander Tansman. Strugała has conducted numerous first-performances of Polish contemporary music both at home and abroad as well as on radio and records. in performing Polish contemporary music. Other prestigious prizes held by the Artists include Grand Prix du Disque F.Liszt (1987), a nomination for the record of the year given by the GRAMOPHONE for the premiere recording of Roman Maciejewski Requiem - Missa pro defunctis, the STERN DES MONATS given by the "Fono Forum" for Xavier Scharvenka recordings (Collins Classics). the Prague Symphony Orchestra in Prague as well as in Germany and Poland, guest conducting with Radiophilharmonie des NDR in Hannover and Wrocław and with the Philharmonic Orchestras of Dresden, Halle, Ljubljana and with Staatskapelle Weimar, Bilkent Symphony Ankara, Florida International Symphony, Kammerphilharmonie des MDR Leipzig and N.Tonkunstler Orchester in Austria. Future engagements include the concerts in Germany, Israel, Great Britain, USA, Czech Republic, Slovakia, Russia (St.Petersburg Philharmonic) and Far East, and also radio recordings of works by Henryk Mikołaj Górecki, Wojciech Kilar, Andrzej Panufnik and Witold Lutosławski for Polish and foreign radios. His recent debut with the operas, the production of Carl Maria Weber Der Freischuetz to commemorate 160 anniversary of Breslau Opera, brought him excellent Polish and international critics and invitations from opera houses, i.e. production of Ludwig van Beethoven's Fidelio for the opening of Polish/German Opera Festival in Posen (2002), and a ballet production of Boris Ejfman Tchaikovsky at the National Opera in Warsaw (June 2003). Besides his intensive concert schedule, Strugała was over 28 years in charge of the International Music Festival "Wratislavia Cantans" as well as Frederic Chopin International Festival in Duszniki Zdrój (1976-1985). Under his artistic and organizational guidance both became recognized as major European music events. 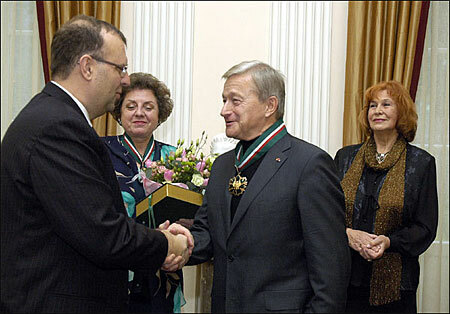 In recognition of his achievements and promotion of Polish music abroad, Tadeusz Strugała has received awards and medals from the Minister of Culture, Minister of Foreign Affairs and "Polonia Restituta Commandor Cross with Star" from the State President. He was also presented with a prestigious Kulturpreis Schlesien des Landes Niedersachsen, and a Doctor Honoris Causa of the Wrocław Music Academy. * In his private life Tadeusz Strugała is a lover of beautiful art objects, and known as a collector of the old conducting sticks - amongst which he is proud to posses the baton Arturo Toscanini, with Maestro's signature. and in November he will chair the Jury of the International Conducting Competition of G.Fitelberg in Katowice, Poland. Tadeusz Strugała with gold medail Gloria Artis, 2006 r.